Do you struggle to remember how or why you connected with someone on LinkedIn? Want to get more out of your connections? By using the Relationship tab, you can build on the connections you need to convert more prospects, close more deals and grow your business network. In this article you’ll discover how to use the LinkedIn Relationship tab to manage your connections and grow your business. Thanks to Jenn Herman for creating this article. Read on. 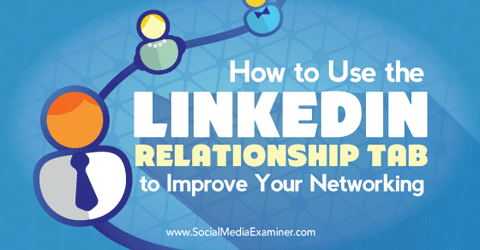 Discover how to use the LinkedIn Relationship Tab to improve your networking. What’s the LinkedIn Relationship Tab? The LinkedIn Relationship tab is a convenient tool that shows you how you’re connected to someone. You can add information to remind yourself of important details about your relationship or set reminders for future interactions. The Relationship tab is available to all LinkedIn users, both free and premium. You can find this tab by opening a connection’s LinkedIn profile on the website or on the LinkedIn desktop version. The tab is not available on the mobile app. Just beneath the profile information are two tabs: Relationship and Contact Info. Clicking on the Relationship tab shows information related to your relationship with this contact. 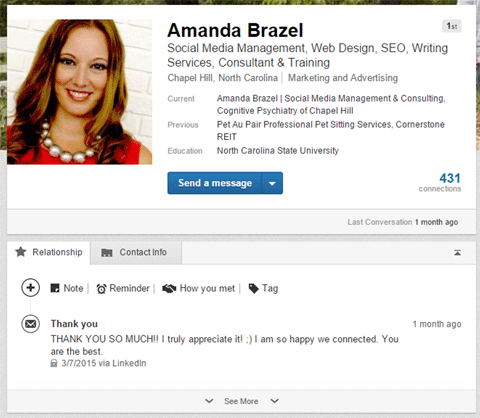 The LinkedIn Relationship tab is directly beneath your connection’s profile info. This information is visible only to you and is unique to you and each of your connections. Now that you understand what the Relationship tab is and where to find it, let’s look at how you can use it for individual connections. 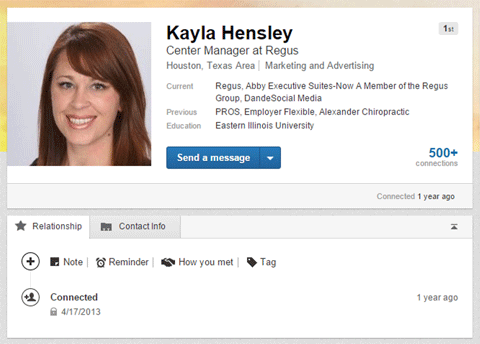 LinkedIn will populate the date you originally connected with someone in the Relationship tab. This information is available for anyone you’re connected to on LinkedIn. LinkedIn automatically enters the date you connected with someone. The date you connected may be helpful if you’ve forgotten how you connected with the person. The date often is enough information to keep track of a growing LinkedIn network. If you’ve shared messages with a LinkedIn connection, these messages also appear in your list of automatically populated details. The most recent conversation appears on the Relationship tab, but you can click on the See More link to reveal the full list of conversations and the date you originally connected with this person. Your most recent message exchange appears on the Relationship tab. Clicking on the title of the message or discussion opens a pop-up screen that shows the entire message trail and details. You can’t access the original message or continue the conversation from this location, but having this quick reminder of how you communicated in the past is a useful way to review your relationship. For example, if you’re developing a relationship with a connection and don’t want to send more than one LinkedIn message a month, you can quickly see how recently you sent your last LinkedIn message. Or if you want to refer to a previous conversation or details, you can quickly access those details before sending out your new message. The first personalized section you can edit on the Relationship tab is the Note section. This is where you can add any details or information related to your connection. Click on the Note tab to open the text box where you can enter key information. When you’re done typing your note, click Save. Add personalized notes to stay on top of key details. This information can be personal or professional. It can be any information that helps you organize your contacts and keep track of your relationships. Include notes for individuals you know will be attending an event, conference or training session you’ll be at. List the person’s unique skills, products or specialties that are relevant to you, so you can easily reference them. If you have been following up on a cold-call development with a connection, keep track of conversations and progress notes. If you come up with questions or action items you want to discuss in your next conversation, list them in a note for easy access and record the answers so you can follow up later. In situations where a person unexpectedly calls you at work, you can quickly look up his or her LinkedIn profile and have immediate access to all of your conversations, history and details you’ve chosen to list. Rather than having to ask your contact to remind you, you already have all of this information and can impress that person with your knowledge and perceived value of your relationship. Easily edit or delete notes to keep your information up to date. You can go back and edit or delete a note after you’ve added it. Just hover over the note in your list of details and click the Edit or Delete button. Using the Notes section effectively can set you apart from your competitors and help you foster real relationships with people you’ve connected with on LinkedIn. The Reminder tool is one of the most useful, yet underused, tools on LinkedIn. It allows you to set a one-time or recurring reminder for a connection. Set reminders to contact your connections and foster your relationships. When you’ve set a reminder, you’ll receive a notification via email (with your regular LinkedIn emails that remind you of birthdays or anniversaries), indicating you have a reminder. You can also go to your LinkedIn Connections tab, and your pending reminders will appear along the top list of activity for your connections. Click on the connection’s name to visit his or her profile and access the reminder details. Once the item is complete, click Mark as Complete, which clears the item from your activity. You can also amend the due date if needed. Because the details of completed reminders are cleared from your activity, it can be helpful to add a note indicating when and what task you completed. The Connections tab shows you any pending reminders. You can set reminders to follow up with a message or email. Set a reminder to send specific information or details you think that connection should see, or that the person has requested. You can also set a reminder to follow up with connections you know will be attending an upcoming event so you can connect with them in person. If you’re fostering a hot prospect or cold-call relationship, the Reminder tool is one of your most valuable assets within LinkedIn. It allows you to set a schedule for follow-up conversations and information sharing that will help you close that deal. And just like Notes, you can always edit or delete a reminder you’ve set. Editing allows you to change the details of the text or the time schedule you’ve set. The How You Met tab is one that you should really take the time to complete for every connection you have on LinkedIn. It can be time-consuming, but in the long run, it’s worth it. As your network grows and you connect with more people, it’s easy to lose track of why you’re connected to people. So take a minute to fill in this section with details about how you connected or met. 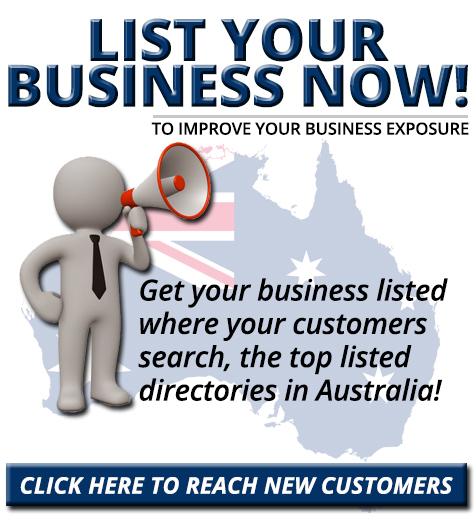 This information will help you keep track of your network and build those relationships to grow your business. Fill in details about how you met a contact. 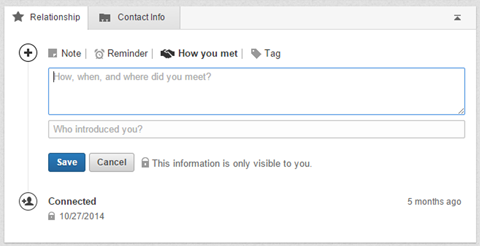 Click on the How You Met tab to open a text box where you can add or paste details of your meeting. Include as much information as you feel is necessary. If someone sends you a personalized LinkedIn connection request stating why he or she wants to connect with you, it’s a good idea to copy and paste it into the How You Met section. The initial conversations and messages you exchange when connecting are not transferred to the message list on the Relationship tab. If you were introduced to a contact or referred by someone, you can also include that information in the Who Introduced You? field. Just start typing the person’s name, and LinkedIn will pull the list of connections you have that match that name. Tags are a convenient way to quickly categorize your connections. And when searching for connections on LinkedIn, there is a filter to sort by tags, which makes this a valuable tool for organizing your network. It’s a good idea to categorize every one of your connections on LinkedIn. You can get as creative or as targeted as you like with your own personalized tag titles. Further categorize and define your connections by assigning tags. To assign a tag to a connection, click on the Tag tab and select one or more of your existing tags. Choose the Add New Tag option if you want to assign a new category. The contact will automatically be included in this new tag category. 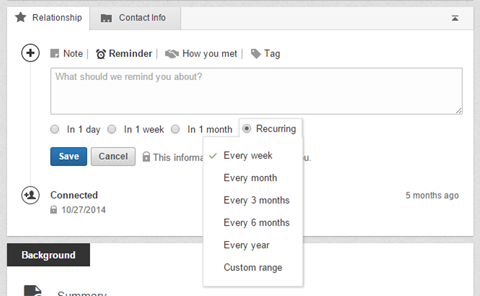 And you can have one contact in more than one tag depending on your organizational structure and details. LinkedIn is one of the most powerful tools for developing your professional audience and growing a network around your business. But it takes a lot more than just connecting with someone to really foster the connections and value that LinkedIn has to offer. Use the Relationship tab to grow your relationships and capitalize on opportunities to connect with potential clients. What do you think? Have you had success using the Relationship tab to build and grow your network connections? 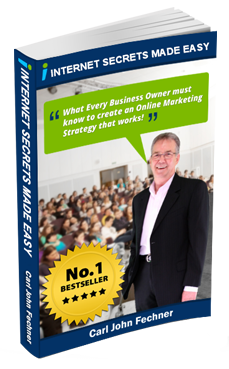 How are you using this tool to set yourself apart from your competitors? Let us know what’s working for you by leaving a comment below!